Daily Illuminator: Futuristic Furry Fun For GURPS! December 20, 2015: Futuristic Furry Fun For GURPS! Guess who's back? It's sparrials -- those furry aliens who excel at taking that which doesn't belong to them! 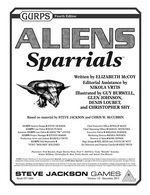 GURPS Aliens: Sparrials is the first GURPS Fourth Edition guide to an entire alien race. Written by Elizabeth McCoy (co-author of GURPS IOU), this meaty supplement offers insight into the sparrial mindset, society, history, and more. Discover their penchant for wanderlust, learn about their predisposition for purloining, understand their unusual mindset about "family," and absorb other vital details that make them truly alien and interesting. This supplement also includes game stats and goodies for these kleptomaniac characters. It provides a racial template, variant races, martial arts, and other intel to create interesting and memorable protagonists or antagonists! You can also meet their pets, take a ride on one of their spaceships, and learn what spells or psionics they might excel at. Sparrials also suggests ways to use this race in your games -- including fantasy settings! Science-fiction excitement isn't limited to the movies; you can make your own galaxies come to life at the gaming table! Download GURPS Aliens: Sparrials from Warehouse 23 and let the sparrials take your breath away . . . and whatever else they can get their hands on!